TAMMACHAT Natural Textiles: Join TAMMACHAT at the Fair Trade Bazaar, May 10-11, 2014 in Halifax, Nova Scotia! 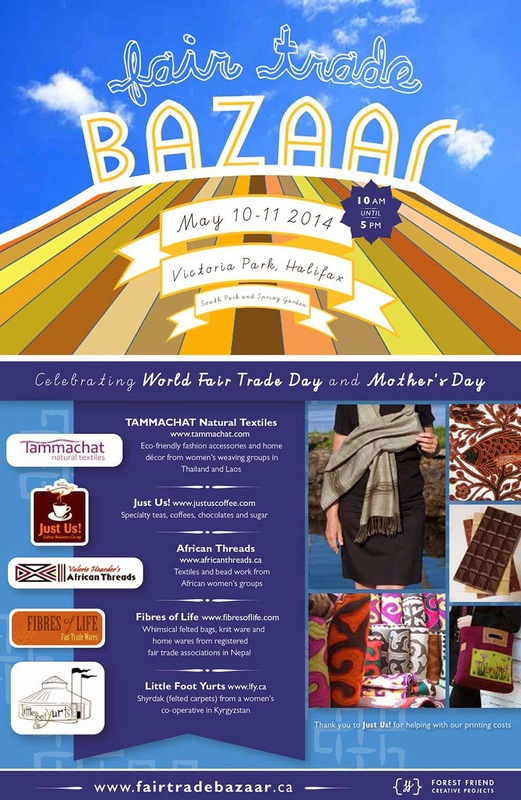 Join TAMMACHAT at the Fair Trade Bazaar, May 10-11, 2014 in Halifax, Nova Scotia! Join us at Nova Scotia’s most unique Fair Trade Bazaar! Come explore the rich and exotic variety of fairly traded goods -- from natural textiles and jewellery to felted carpets and textile art to women's accessories, handbags and home wares. Celebrate Mother's Day and World Fair Trade Day by supporting local Nova Scotian businesses that practice globally conscious trade with cooperatives and other groups in Asia, Africa and Latin America. Look for the yurt – a traditional Central Asian shelter, locally made in Nova Scotia! For more information, contact Selene Cole at info@lfy.ca. TAMMACHAT Natural Textiles offers fairly traded, eco-friendly fashion accessories and home décor, exquisitely handwoven in limited editions in Thailand and Laos. Hand-picked or co-designed with rural women’s weaving groups, these textiles showcase the artisanal skills and traditions of generations of Thai and Lao weavers, blending contemporary design with traditional techniques. With each purchase you own a small work of art and help women artisans celebrate and sustain their culture, families and communities. For every piece you buy, TAMMACHAT donates a book to a child in Laos published by Big Brother Mouse, a Lao-owned social enterprise. Just Us! is Canada’s first Fair Trade coffee roaster. As a worker owned co-op, we believe in "People and the Planet before Profits™." Our goal is not only to sell the best products at the best possible prices, but also to promote global economic justice. Just Us! offers you a choice of specialty teas, coffees, chocolates and sugar – all Fair Trade and Organic. Little Foot Yurts, in partnership with Altyn Kol (Golden Hands), a women’s co-operative in Kyrgyzstan, is helping to provide a fair income to artisans and introduce the shyrdak, the traditional Kyrgyz carpet, hand-made from felted wool. Each shyrdak is hand felted, hand dyed and hand stitched, creating an individual art piece suited for contemporary and traditional interiors. The artist reflects her dreams, thoughts and visions, as well as the beauty of Kyrgyzstan and its nature, via symbolic patterns and ornamental design. Altyn Kol is a women’s handicraft co-operative in Kochkor, Kyrgyzstan specializing in creating the finest handmade felt products. The mission of Altyn Kol is to provide income to the local felt artisans of the Kochkor Region and thus carry on Kyrgyz culture and traditions for generations to come. Fibres of Life works with registered fair trade associations in Nepal to create whimsical felted and knit wares to wear and for your home. We love making products that you can customize and adapt. Make your own custom design of handbag with removable hand printed panels, and button-on and off another panel to change your look as your mood, the season and your style changes. Also check out our rich mohair and merino wool knitwear line including our convertible beret/tam hat, various hand wear, and our 'Wear-it-9-Ways' shawl. And for lifestyle and home, our felted tea and french press cozies, or our line of baby and kids toys and wearables. Yurts are the traditional nomadic home of Central Asia. The yurt is a collapsible framework of wooden poles covered with felt and canvas. The design of these ancient shelters has remained unchanged for over 1,000 years. Having proven themselves over many centuries, they remain one of the oldest indigenous forms of shelter still in use today. Today yurts are used all over the world as people are interested in alternatives to conventional building and want to live more intimately with nature. The Champagne yurt is 28 feet in diameter and 615 sq feet. It is hand crafted using natural and local materials by Alex and Selene Cole of Little Foot Yurts. The glamorous Champagne yurt will be elaborately decorated with traditional Kyrgyz decorations.